Borchert Field: Baseball, football, and - soccer? We've talked a little about Borchert Field's time as an NFL stadium, and its baseball history is well known, but the corner of 7th and Chambers was home to more than just the Brewers and Packers. Reportedly, the field was flooded and frozen during the winter months so Borchert could host hockey games. 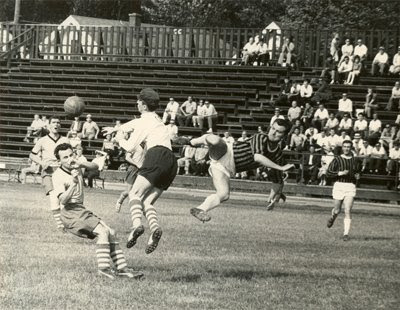 And given Borchert's long history and Milwaukee's great local soccer tradition, it shouldn't surprise anyone that the Orchard should have seen its share of the Beautiful Game. I love this photo, with the row of houses visible just behind the outfield bleachers. It really captures Borchert's neighborhood quality.